404. 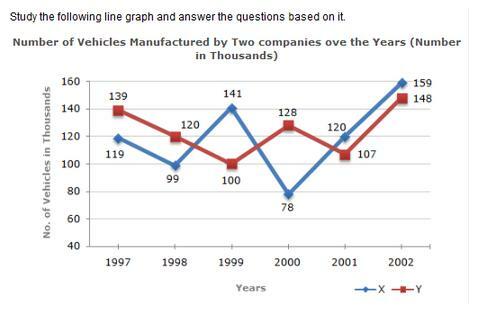 What is the difference between the number of vehicles manufactured by Company Y in 2000 and 2001 ? 405. What is the difference between the total productions of the two Companies in the given years ? 406. What is the average numbers of vehicles manufactured by Company X over the given period ? 407. In which of the following years, the difference between the productions of Companies X and Y was the maximum among the given years ? 408. The production of Company Y in 2000 was approximately what percent of the production of Company X in the same year ?